In We’re No. 1, The A.V. Club examines an album that went to No. 1 on the charts to get to the heart of what it means to be popular in pop music, and how that has changed over the years. In this installment, we cover Bob Dylan’s “Blood On The Tracks,” which spent two weeks at No. 1 on the Billboards album charts beginning on March 1, 1975. Despite the common perception, Blood On The Tracks is not an album about divorce. It’s easy to confuse it for one because Dylan eventually did call it quits on his marriage, but that came years later. Blood On The Tracks is actually a lot more like a temper tantrum mixed with a pity party. It’s an album about the withering thrills of early romance, and it lashes out against it. As the children of the ’60s grew into adulthood and the cold realities of life piled up, the voice of that generation was once again echoing back to them what they already felt. Blood On The Tracks is what happens when hope and optimism turn to pain and confusion. Bob Dylan first met his future wife Sara Lownds sometime in 1964 while she was still married to her first husband, the photographer Hans Lownds, and while Dylan was still romantically linked to fellow folk singer Joan Baez. The ethereal Sara was working for Time Life and was an old friend of Sally Buchler, the reclining model in red featured on the cover of Bringing It All Back Home who would go on to marry Dylan’s manager, Albert Grossman. There was an immediate chemistry between Lownds and Dylan, and within a year or so of their initial encounter, they’d both ditched their significant others and had taken up with one another. After a very low-key 18-month courtship, the duo tied the knot on November 22, 1965, while she was pregnant with their first child, Jesse. One of the seminal moments of Dylan’s artistic narrative came shortly after the nuptials on July 29, 1966 when he crashed his Triumph Tiger motorcycle riding around his home in Woodstock, New York. Almost overnight, the paragon of social justice, the voice of generation, went silent. Around the world, people speculated on the nature and the degree of his injuries, wondering when or even if he’d ever be able to recover. Of course, as history proved, the accident was nothing more than an albatross; an excuse to draw back from the impossible pressures that his audience exerted on him. The public continuously clamored for him to become more than he ever wanted to be himself. For roughly the next seven years, Dylan, at the height of his cultural import, traded in his rock-star status to become a better husband and father. Rather than becoming a recluse, he recorded and released six albums in that span—to decreasing critical acclaim—in addition to his work with the Band on the renowned Basement Tapes. But outside of one-off gigs like The Johnny Cash Show in 1969 or the Concert For Bangladesh in 1971, he kept close to home. 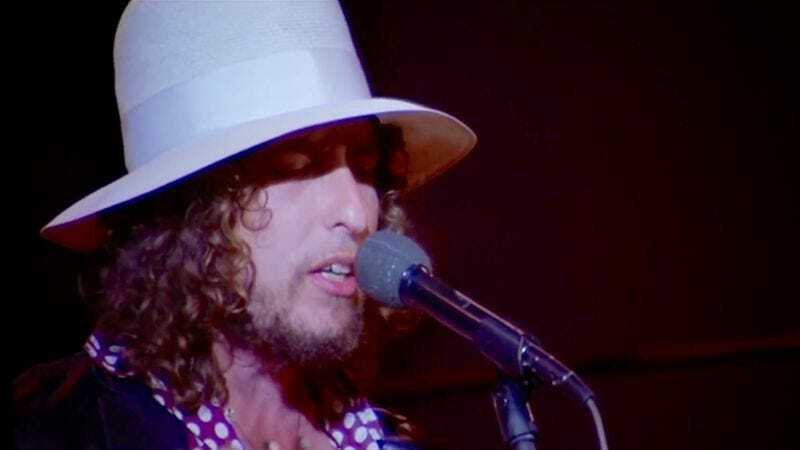 In 1973 and after many years, Dylan ditched his longtime label Columbia and signed a new deal with the emerging David Geffen-headed Asylum Records. Shortly thereafter he reunited with the Band, recorded the album Planet Waves, and embarked on a massive, 40-date North America “comeback” tour that kicked off on January 3, 1974 in Chicago. From a commercial standpoint, the outing was a gigantic success, but Dylan remained unhappy. Planet Waves flopped and when he returned home, his relationship with his wife grew increasingly distant until they became completely estranged. Oddly, a lot of the tension stemmed from a home remodeling project. In 1973, the Dylans packed up and moved to Point Dume, California. Initially, Sara wanted to add an additional bedroom onto their new home. From that small idea the project grew increasingly large and more elaborate, growing to include a new fireplace, rippling out on an almost weekly basis. The couple that had hardly ever argued about anything were now in each other’s faces about everything. Bob then took off for the road, his eye began to wander, and pretty soon, his marital vows went out the window and he began cheating on Sara with a record executive named Ellen Bernstein. By the summer of 1974, Dylan’s behavior grew increasingly erratic. He started drinking and smoking again and Sara had had enough. The husband and wife decided to go their separate ways, and Bob settled down in a farmhouse back in his home state of Minnesota. A short while later he called up his mentor John Hammond and told him that he planned to record a number of “private songs” come the fall. On September 16, 1974, Dylan entered Studio A at A&R Studios in New York and got on with it. It was the same room he’d worked on so many of his classic records in, and as he began work on what would turn into his next album, he returned to the studio in hopes of recapturing those heralded sounds. Acclaimed engineer Phil Ramone, who bought the space from Columbia in 1968, was enlisted to man the boards, and brought along his assistant Glenn Berger to lend a hand. Just two days after Christmas, Dylan convened with a number of local session musicians at Sound 80 studios in Minneapolis and re-recorded five of the albums 10 tracks, including its emotional core, “Idiot Wind.” A little over three weeks later, on January 20, 1975, Blood On The Tracks was finally released. Two months later it hit No. 1 on the Billboard album charts. 1975 really was a weird, transitional time for America. The last troops were just being pulled out of Vietnam and the nation was still reeling from the embarrassment of the Watergate scandal. The hippie generation that had grown up in the ’60s had long lost their innocence and many had lost their way entirely. Unwittingly, Dylan had created a record that perfectly conformed to the mood of the moment. It was one whose themes and attitude dovetailed with so many of the feelings that his most ardent fans and casual supporters were experiencing in their own lives. They still nodded their head in unison with the music, but now it was with resignation rather than youthful determination. The album ultimately sparked a new career renaissance for Dylan. Later that year he wrote one of his most celebrated songs “Hurricane” about the boxer Rubin “Hurricane” Carter who was sent to prison under dubious conditions thought to be motivated by racism. The next year he would release that song on the record Desire that would also hit No. 1 on the charts and achieve double-platinum status. That album closed out with the track “Sara” where—in direct conflict with his feelings on Blood On The Tracks—Dylan tried to woo back his wife. It worked and it didn’t. The couple reconciled for a time, but eventually, Sara filed for divorce on March 1, 1977. The matter was settled by June 30 with a settlement rumored to number $36 million. No matter how vigorously he’d like to claim otherwise, that’s exactly what Dylan did, and it’s one of the reasons why Blood On The Tracks ranks among his greatest works. Dylan is an artist who, nearly to the point of self-sabotage, follows his muse. Throughout his entire career he has blindly followed those intrinsic internal urges and allowed them to shape his music and move his pen. His best art comes when those urges overlap with his own thoughts and feelings, or alternatively square with the mood of the times. With Blood On The Tracks, they did both.